It's no ‍‍‍secret... our founder and school are lovers of boxing arts. 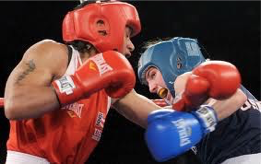 The boxing arts you can experience at our school range from certified USA Western Boxing aka the Sweet Science to Thai Boxing to Filipino Boxing concepts, drills and applications‍‍‍ which derived from weapons based training. Our belief is these various formats of "boxing" offer tremendous benefits. You'll improve your coordination, reflexes, speed, quickness, rhythm, footwork, strength, cardiovascular conditioning, lose those pounds if that’s your goal while learning practical, effective self defense. You can never go wrong supplementing your Muay Thai training or even other activities outside of martial art with some good old-fashioned boxing! We highly recommend boxing classes for individuals not necessarily sure about Muay Thai Kickboxing (it will win you over in due time) for their body, size, flexibility etc... but absolutely want to get off the couch or change up the routine a bit. Our Boxing class is great for all ages, starting 8 years old and up. Simply fill out the contact information form on this page with correct information and a team member will contact you within 24-48 hours. You can also schedule your KICKSTART TRIAL PROGRAM on our website or call us at (425) 82‍‍‍3-4415 to speed up the process. We enjoy talking to real people ready for real life enhancing martial arts experience. Amazing things happen when we take action!